For 18 years WPCA has celebrated this rich Hispanic tradition. The celebration will include Ofrendas (altars/offerings) created by local artists as well as other artwork related to this holiday. Dia de los Muertos (Day of the Dead) recognizes death as a celebration of life. It reminds one to reflect on what they value through the commemoration of loved ones and their lives while at the same time generating enthusiasm for the friends and family around us. As the celebration progresses, this dynamic gathering transforms itself into a festivity of life. Join us at the reception for a biligual presentation on Dia de los Muertos as well as music and poetry throughout the evening. The Dia Parade will begin at the United Community Center (1028 S 8th ST) at 5:00 pm and end at WPCA (839 S 5th ST). 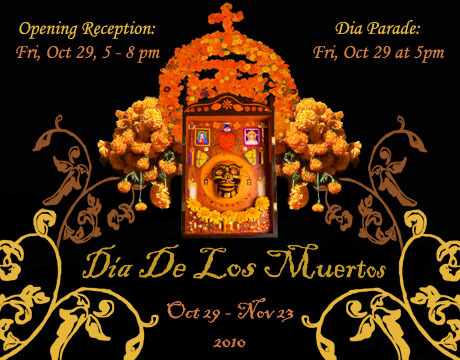 Informational Tours of WPCA’s Dia de los Muertos Exhibition are available. Please contact Gary Tuma at 414.672.2787, or email: gary@wpca-milwaukee.org.